When a story breaks in Yemen, you’ll usually find Khaled al-Hammadi somewhere in the middle of it. The journalist even camped out alongside demonstrators in Change Square, the impromptu village they erected in February 2011 in Sana’a, the country’s largest city, shortly after a wave of anti-government rallies inspired by the revolt in Tunisia. Unrest has simmered in Yemen ever since, with numerous deadly clashes between supporters of president Ali Abdullah Saleh and protestors. 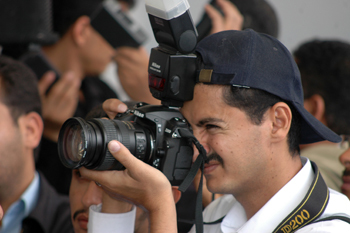 Al-Hammadi, a recipient of CJFE’s 2011 International Press Freedom Award, has been immersed in reporting on the events. He is a freelance producer for Al Jazeera English TV, a journalist for Al Jazeera TV and a correspondent for London-based Arabic daily Al-Quds Alarabi. He has also worked as a photojournalist for Agence-France Presse, capturing vibrant portraits of Yemenis immersed in their everyday lives, and as a stringer for international publications; it’s not uncommon for him to be credited in the New York Times. For chasing stories, al-Hammadi has been threatened, attacked and tossed in jail. Al-Hammadi has charmed candid conversations out of even the most tight-lipped sources, including high-level terrorists, military leaders and government officials. He was the first to interview Abu Jandal, Osama bin Laden’s former bodyguard, a journalistic coup that provided a rare peek inside the terrorist cell. He’s trusted by locals and is a reliable source for checking rumours and gossip, producing a steady stream of tweets (@KhaledHammadi) in Arabic and English about what’s happening on the ground. Dana Lacey (@danalacey, danalacey.wordpress.com) is a freelance writer, photographer and editor in Toronto. Each year CJFE bestows two International Press Freedom Awards in recognition of the courage of journalists who work tirelessly - often risking their lives - so that the news media remain free.